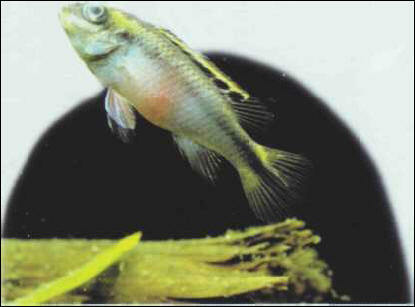 The kribensis is a native of Nigeria; it thrives in hard, even brackish waters with abundant vegetation. The female lays 200-300 eggs in a cave, tending them while the male defends the site, though he is less aggressive than other Cichlids. The fry are free-swimming 1 week after hatching. Size: 10 cm.